Island Wellness is a locally owned healthy lifestyle hub servicing Carolina Beach, NC and beyond. We provide high quality supplements and superfoods, natural skincare and wellness products, essential oils and locally made gifts, and locally brewed kombucha on tap! Our goal is to educate and inspire our community to live happy, healthy, connected and fulfilled lives, the way nature intended. We love island life. We believe in the healing properties of nature. We love feeling good. We love helping others feel good too. Find your way to Island Wellness. The idea for Island Wellness was born in 2011 by founder and owner, Amy Sawyer. In 2009, Amy considered all to be well. She and her husband had been living in Carolina Beach for nearly ten years; both had solid, well-paying jobs with benefits; they were able to travel and enjoy life on the island, and were often surrounded by fun activities, family and friends. A health scare that Thanksgiving redefined what wellness meant. As Amy recuperated from her ordeal, which included a hospital stay and a month of medical leave from work, she began to discover a new version of wellness. She realized that a high paying job loaded with stress was not healthy. On March 1, 2012, Amy resigned from her corporate job and set foot on the path to Island Wellness. She opened Island Wellness Market - a health food market geared not only toward providing natural and organic products, but also a forum intended to help educate the community on how to live a more healthy, balanced life. After a personally challenging year in 2015, she embraced her on-again, off-again yoga practice and enrolled in yoga teacher training to focus on some much needed self-care. After experiencing the profound personal and spiritual growth that a regular practice had in her life, she felt called to teach and share yoga with others. 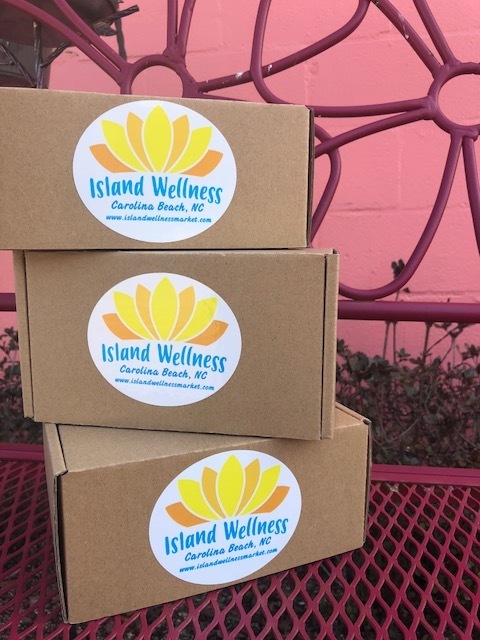 In doing so, Island Wellness has evolved into more than just a health and vitamin shop in Carolina Beach. It has expanded beyond its walls into the community. Amy has created a hub for healthy lifestyles that not only includes all the high quality natural products you've come to expect, but also insights and inspiration for living authentically, staying present and discovering your true potential. Look here for healthy lifestyle tips, supplement recommendations, nutrition news and favorite recipes. Get healthy inspiration delivered directly to your door with the Inspired Wellness subscription box. Wellness is a journey. Read my story and revelations as I walk the path to a healthier mind, body and soul. Our mission is to inspire you to live healthy and happy. We provide carefully selected natural products to nourish your body and soul, as well as insights and wellness tips to help you achieve your highest potential. Each month we'll bring some of our favorite things to inspire wellness directly to your door. Each box contains hand-picked items to inspire wellness of body, mind and soul. Subscribe just once or sign up to receive inspired wellness on a regular basis. Treat yourself or gift to a friend. Maybe our favorites will become some of your favorites too. We offer a variety of high quality vitamins and supplements, as well as natural skincare and cruelty-free health and beauty items. We also offer locally made gifts along with locally brewed kombucha on tap, made with love by our friends at Panacea Brewing Company. We pride ourselves on carrying products from companies with strict quality assurance guidelines, high ethical standards and eco-friendly practices that support the health of our planet as well as our bodies. Island Wellness is more than healthy products; it's a lifestyle. In addition to managing the the retail store, Amy seeks to inspire others through yoga and spiritual inquiry. Island Wellness now shares space with Salty Dog Yoga, where Amy also teaches, which has created some really magical synergy. From health inspired workshops to Reiki and yoga, there is always something fun to explore. Information on Amy's current class offerings and private sessions, as well as our new shared space can be found here. The love of wellness and yoga is not contained to just our physical walls. Island Wellness, together with Salty Dog Yoga, also hosts local day and weekend retreats and excursions, as well as international yoga and wellness retreats to various inspiring destinations. We work together to create unique and fulfilling adventures for our local community and beyond. We are passionate about helping others to love and nurture themselves in fun ways and to fully embrace each moment.